I just wanted to update everyone on why there hasn’t been a post in the last few weeks. As a future Elementary Educator, trying to find a job here in Alaska is tedious and take a lot of time. I have had to step away from the blog and take care of those priorities. However, I will be reviewing a box that I haven’t seen on a blog or reviewed anywhere. 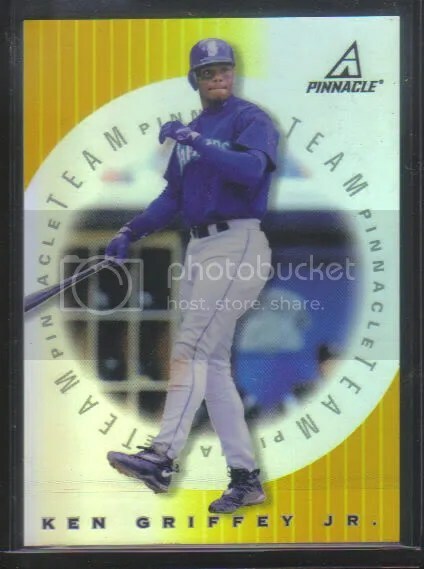 When I was building my large Rodriguez collection 2 years ago, I came accross an insert called 1998 Team Pinnacle. These cards are extremely hard to come by and 1998 Pinnacle Plus wasn’t overly produced. I was fortunate enough to find a box on the bay and purchased it this morning to break for the blog. It is my hope to come across a rare gold parallel of the Team Pinnacle inserts. Here is an example of the inserts that Ken Griffey Jr. collector Magigpapa called, “One of the best looking inserts I’ve seen.” This means a lot coming from one of the biggest 90’s collectors out there! The odds are we won’t find one but I’ve always wanted the chance to open the last Pinnacle Baseball product produced. Stay tuned later this week for the review and an update on my Rodriguez collection. Have a great weekend! Keeping the theme from the last post, I busted a box of 1998 Pinnacle, the last basic Pinnacle set ever. Sad, I know. This box contained 20 packs of 10 cards each and cost me about $22. Was it a memorable way to go out? Let’s examine. Base cards: The base cards are sharp with crisp photos, full-bleed design, and the player’s name and position running up the right side in a holo-foil treated font. There are 200 cards in the set, including a couple of subsets and checklists. The subsets are Field of Vision (6 cards) and Goin’ Jake (10 cards), which pays tribute to the participants of the 1997 Home Run Derby. The collation in this box was simply awful. I only pulled 120 different base cards out of 200, for exactly 60%. I had 62 doubles and 11 triples! Museum Collection (1:9 packs):There are 2 partial parallels in this product, Museum Collection being the easier one to attain. The reason I say “partial parallel” is because these cards don’t mirror the entire base set. In fact, they only mirror exactly half of them so the numbers in this set will not always match the numbers in the base set. As a random example, Scott Rolen is basic card number 39, but Museum number 37. Basically, only stars, semistars, and better prospects are included in the parallels so you won’t be seeing players like Butch Huskey in this. I pulled 3 Museums in this box: Jose Cruz, Jr., Mike Piazza, and an Alex Rodriguez Field of Vision. Hit it Here (1:17 packs):Hit it Here is a 10-card dufex-loaded (well, actually all the insert sets here except one are) insert set that falls roughly 1 per box. I pulled 2 in this box: Frank Thomas and Mark McGwire. These cards have serial numbers on the back as well, 10370 and 10107 respectively. There was something significant about these numbers, some sort of contest, but I can’t remember what exactly. 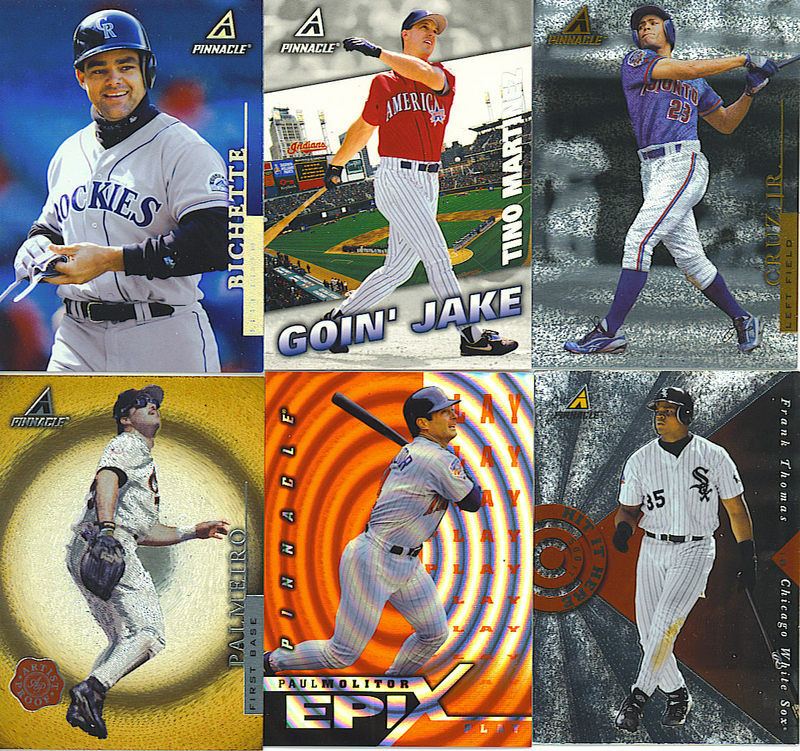 Epix (1:21 packs): Epix was a big cross-brand, multifractured insert set produced by Pinnacle in 1998. These were randomly inserted into packs of Pinnacle, Score, and Zenith. There were 24 players in this set and each had 12 different Epix cards to chase after! There are 4 tiers in this set. They are (in no particular order): Play, Game, Season, and Moment. Each of these tiers is also available in 3 different colors: Orange (common), Purple (rare), Emerald (very rare). There are no stated odds on any specific tier/color combinations with the exception of the Emerald Moments, which have a print run of just 30. In 2005, Donruss brought this set back and added a few extra colors: blue, red, and black. In my opinion, they weren’t quite as cool as the “oldschool” version, but at least Donruss numbered those so you had some sort of idea as to what you were holding. If this all sounds like a giant headache, that’s because it is. Oh yeah, the card I pulled was an Orange Play of Paul Molitor. Artist’s Proof (1:39 packs): The second (and much rarer) parallel found in this product is the Artist’s Proof. These are found in every other box on average and feature a swirling dufex pattern on a gold background. Like the Museum cards, this is also a partial parallel. In fact, the 2 parallels, share the same checklist. I pulled a Rafael Palmeiro. Anybody seen him lately? What WASN’T Pulled: Aside from 1/1 printing plates (1:1250 packs), the one insert I didn’t pull any of was called Spellbound. Spellbound is a 50-card set with 9 featured subjects. Each card features a letter from the player’s first, last, or nickname with the idea being to spell out your player’s name. Here’s a list of who is in this set. What you could spell out is in BOLD. Here’s what a Larry Walker looks like. Personally, I thought these looked better in 1997 New Pinnacle. Spellbound cards usually fall at a rate of 1 per box. By the way, this is the only insert set with big, stupid letters on them (screw you, manufactured letters) that I approve of. Final Thoughts: This was a pretty loaded box! Despite the fact that I got WAY more duplicates than any one person should be allowed, I was very happy overall. The inserts and parallels all looked great and certainly weren’t short on the star power! 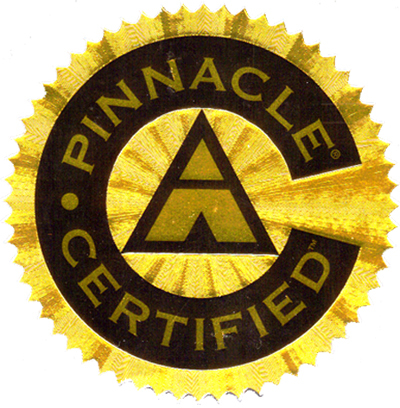 I can’t say for sure if I’ll be busting more Pinnacle products in the future, but don’t be surprised if you see another “Grudge Match” in the near future! Mario had the edge on me in the inserts department and I don’t think he had quite as many as 30 dupes in his box. Meanwhile, I had my snazzy mirror card. Vote away!